The coaching stock designed for the Great Western Railway by its last CME, Mr F W Hawksworth, is easily recognised by its sloping roof ends and almost flat sides. Lot numbers for the first batch of coaches were issued in 1944 and they continued production until 1954, well after nationalisation. The vehicles must have been highly thought of, as they were chosen for the reintroduced high-speed Bristolian service in 1954, even though British Rail had introduced its own similar MK I stock by this time. However, two years later the brown and cream liveried MK I stock finally replaced the Hawksworth designed carriages. W2242 was one of a batch of twenty built under lot No. 1744, to diagram D133, in 1950. It was in use on passenger trains until the late 1960s. In about 1970 is was converted into on-site accommodation for the staff of a Plasser and Theurer ballast cleaning machine, wherever they were working on the railway network, and it travelled all over the country. In this guise it became DW150391. 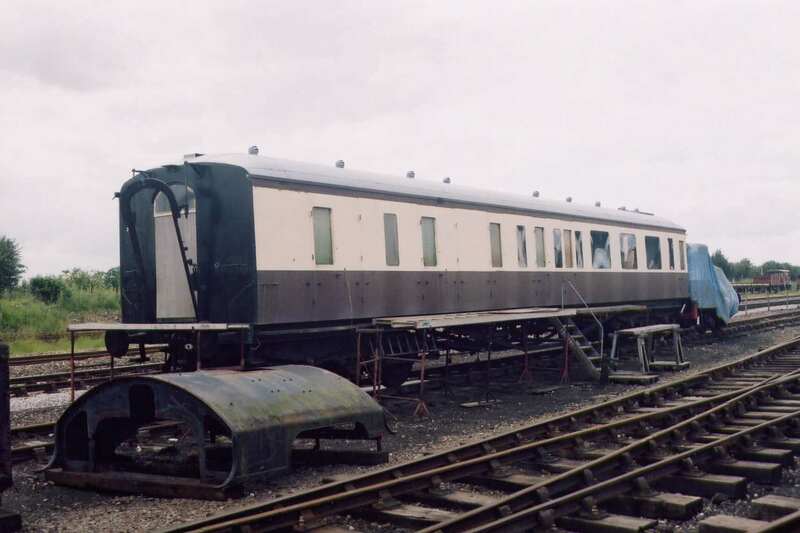 Withdrawn August 1982, it was delivered to Quainton on 30 January 1983 having being purchased by the owner of Hawksworth locomotive No. 9466.